Being a new parent means that there are a lot of things to look out for. And indeed your little one will need a lot accessories in addition to regular needs to foster their growth. One of the things that every parent cannot go without is a perfect baby swing. Having a good quality baby swings helps the parents and at the same time provides comfort to the child enormously. Good swings are not only comfortable. They guarantee the safety of your child more too. Below is the list of top 10 best baby swings in 2019 that you should not miss. Graco Simple Sway Multi-Direction Baby Swing is one of the best swings that are very effective at calming your baby. This swing has a good design to fit with any babies that weigh around 30 lbs or below. It has two different ways of operation to swing your child. They consist of plug in operation and battery operation. Therefore, you can still let it swing your baby when you’re going outdoor or during the electricity cut out. 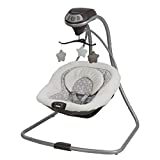 Graco Simple Sway Multi-Direction Baby Swing has an ability to calm your kid with its 15 sounds of nature and melodies. Having 6 swinging speeds, this product allows you to choose any one of them to meet your baby’s preference. A portable baby swing that we have selected as the ninth choice for this review is Graco Slim Spaces Compact Baby Swing. This product allows you to fold it up once you no longer use it. As a result, you save a lot of space for storage and so very easily portable. You can also adjust the height of this swing by pulling the legs up for easier and more convenient check on your baby. It also comes with a carrying handle to help you easily lift the swing up. This baby swing is enclosed with high quality fabric to ensure that there is additional padding for the kids. The head support can be removed which makes washing a lot easier. Your little one needs to be equipped with the best baby bouncer and as a very caring parent, you will not look past the Sportspower My First Toddler Swing. This baby swing functions as both indoor and outdoor playing instrument for your 9 month old or above babies. The seat is attached with safety harness to ensure there is higher security while swinging. Featuring a lightweight design, this product makes it easy for parents to transports to different places. It also has a sturdy construction which creates greater durability for long term usage. The sidebars are also constructed with heavyweight steel to enhance stability and safety. The installation of this swing is simple and can be done within a short time. Like other best baby swings, Fisher-Price Sweet Snugapuppy Swing would be the one to entertain your kid. 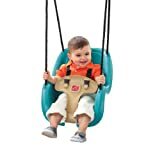 This swing allows you to soothe your child with either right-to-left swing or back-and-forth swing. A pressing button is designed for the ease of use. With just a click, you can adjust the swing to a different position. This product comes with seat and head foams to enhance better padding for your baby. The head support and mat allow you to remove for easy washing up. You child will love the swing as there are a few available plushies. The top 6 best baby swing chair on the list is Fisher-Price Moonlight Meadow Cradle ‘n Swing. This swing helps every parent to operate with ease by simply touching on a button. It has 16 songs and sounds in total that are created to rejoice your kids. You may change your baby’s sitting position from center to right or left facing with a single click on the functional key. With the plug-in operation, you can choose it instead of battery operation in case the swing runs out of battery. It also comes with sturdy construction to ensure that security and stability are always there. This is one of the baby swing reviews that is very useful to every parent. Graco Simple Sway Baby Swing has two speed operations for you to soothe your child. The product has compact frame design allowing for easy storage as it can fit in any place. If you find buying a battery a waste, you may save money by using the wire plug in operation. The swing features hanging stars from above for additional entertainment of your baby. It is lightweight for ease of transportation from one destination to another. For better and easier washing, you can take the fabric out and put it back once the washing is done. What is more to be added on the list is Fisher-Price My Little Snugabear Cradle ‘N Swing. It is one of many outdoor baby swings that is built with quality. The product is also engineered with smartswing tech for excellent baby smoothing. This baby swing allows you to calm your kids in different ways. you can also choose to calm your baby by selecting either a side-to-side push or head-to-toe swing. Within 16 songs and sounds of nature, it is great at calming and entertaining your little ones. It also has the attached plushies from above to help develop your kid’s brain and learning. Fisher-Price My Little Snugapuppy Cradle ‘n Swing is one of the first choices to look at if you desire the best infant swing. This swing comes with 2 motions of operating system for better child soothing. It has songs and sounds that are good for your kid’s entertainment and development. With 6 different built-in speeds, you can choose a prefered moderation to meet your baby’s liking. You can also remove enclosed fabric and have it safely washed by any washing machine. Moreover, the swing has a single click button that makes it easier for you to change your child’s sitting position. The product has a heavyweight construction to ensure that there is durability and longevity. Step2 Infant To Toddler Swing Seat scored more customer satisfaction than most of the swings we have reviewed so far for its unbeatable functionality. This swing functions as both an indoor and outdoor swing. It has a securely made seat and a weatherproof robe to ensure that there is always safety for your kid. Having an attached safety harness, Step2 swing can well protect and keep your kid in place in every swinging position. The safety harness also features a pair of high quality clips so that it is guaranteed to not fall off in the middle of the way. You can easily clean the seat by wiping it with wet towel. Little Tikes 2-in-1 Snug ‘n Secure Swing is the top product that will rock and entertain your baby swinging experience to the fullest. The seat of the swing is made of high quality product, so your baby will not experience any pain as they rest. It is large enough to lodge any kids aging 9 months or older. Its durable and sturdy robe have an ability to hold the entire swing and the baby for years. Coming with shoulder straps, it increases higher safety for your little ones during the swing. The seat is made of good quality plastic that allows you to easily clean it with wiping towel. It is originally a product of the U.S, so you can rest assure that the quality and lifetime of the swing is rarely an issue for any parent user. All of the baby swings mentioned in this review will help to fulfill your baby’s needs and comfort. They may carry different features, yet they share very high quality and good functionality in common. These two main factors make these picks the top 10 best baby swings in 2019 on the market.